Fantastic! Our hardware works. 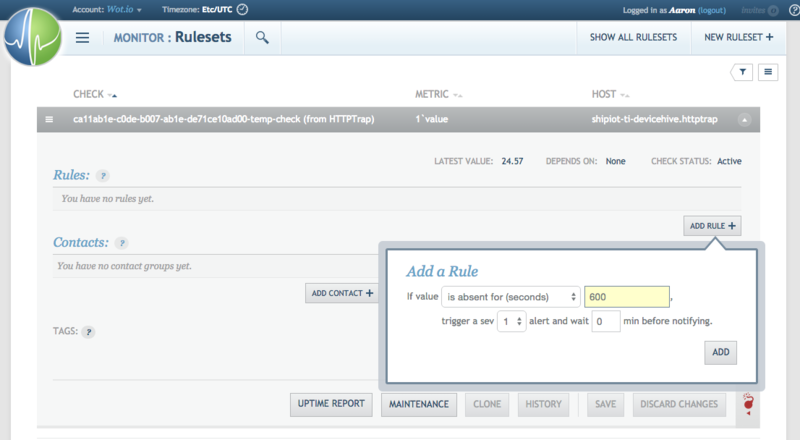 Now we are going to hook some data services up using the wot.io data service exchange™, and do some fun stuff with it. Below is a diagram of the message flow. 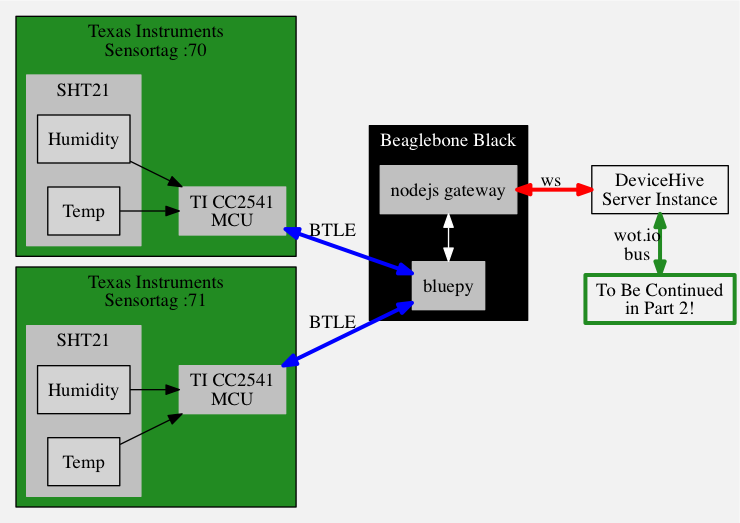 All the green lines are implemented using the wot.io data service exchange™ (which I also call the bus), connecting data service sources to data service sinks. You'll notice that some of the scripts, bips, and graphs are named temperature, and others are named color. I have a confession - to save time, I just stuck with the default setup that comes out of the box with wot.io's Ship IoT initiative which converts temperature units and maps them onto the color spectrum for use with some Philips Hue bulbs like we saw in an earlier post. I just figured that since wot.io has so many data services, and I have so little time, why not just re-use what was already done? So, let's just agree to ignore the fact that scripts named color might no longer have anything to do with color. Maybe we're just coloring our data. Ok? Onward! key: "name" | "value" | "units"
units: "C" | "F" | "%RH"
Now we are ready to sink these normalized messages back onto the bus for further processing by other data services. As the message flow graph above illustrates, messages from transform will use the bus to fan out and sink into convert and color in scriptr, and also into bip.io and Circonus. This is a utility set up to demonstrate data transformation and message decoration. We take messages from the incoming data source, parse out the type and units, and create a new data structure with additional information based on the incoming message. This data source will be sent in a message to whatever sink is configured. A more complex implementation could take incoming data, perform lookups against a database, add semantic analysis, analyze for part-of-speech tagging, or do any number of other things. Complex message graphs composed of small, well-defined services let us build up behaviours from simple parts—much like the Unix philosophy when it comes to small command-line tools. In this case, we convert Celsius to Fahrenheit, or Fahrenheit to Celsius, depending on what the incoming format is, and put both values into the resulting message. For humidity we simply pass along the value and label it as rh for relative humidity. 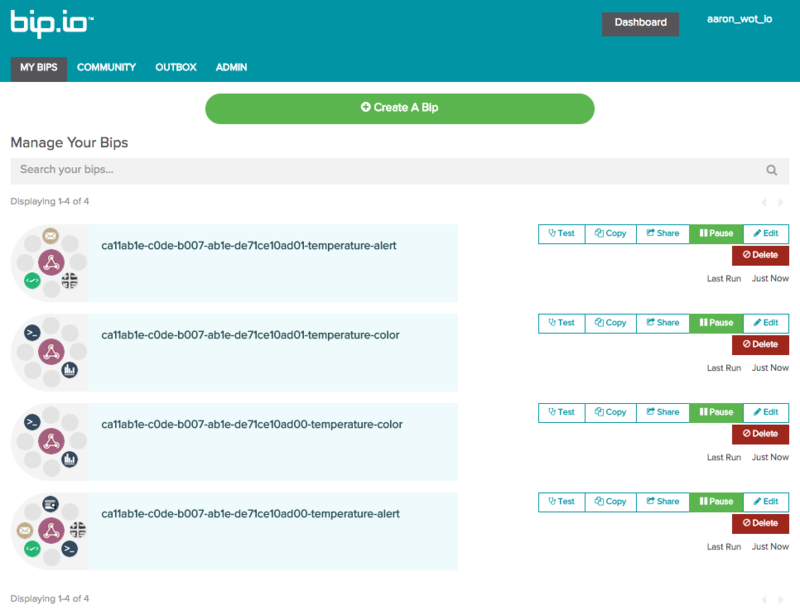 Once again, this script was originally meant to control a Philips Hue lamp, but we've co-opted it to send data along to bip.io and control our furnace. (I've left in the color calculations if you're curious). It would be trivial to expand the message graph in bip.io to do the lamp control, I just didn't have the time to set it up. Aren't I quite the model of efficiency today? // the thermostat settings later on and nothing else at this time. 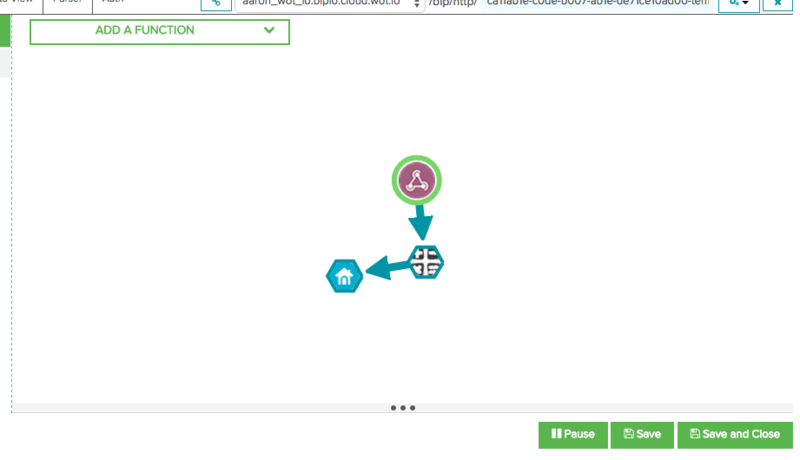 Circonus is designed to collect your data into graphs, dashboards, analytics, and alerts. 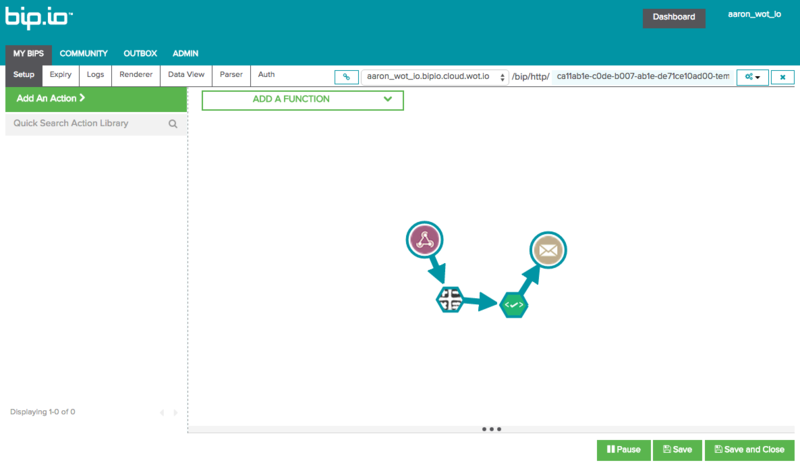 While it is often used for DevOps or IT Operations style monitoring, we're showcasing how well it serves as a key component of an IoT solution. 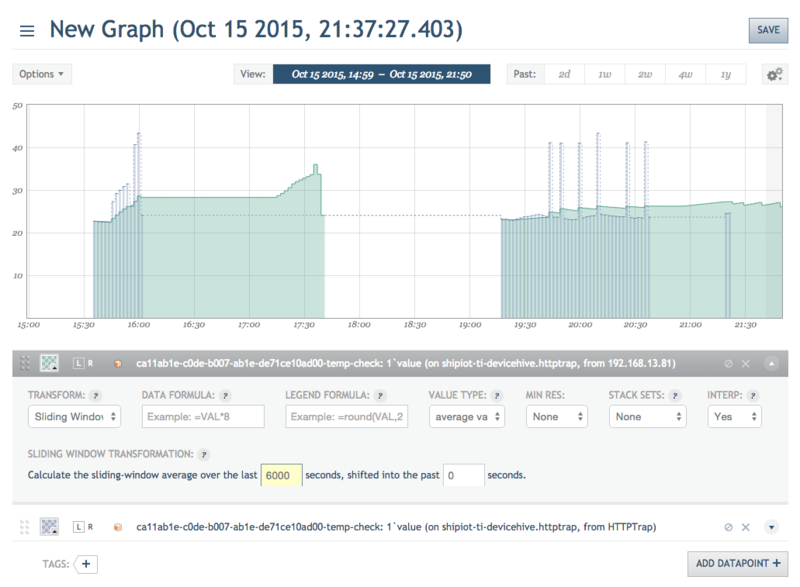 Today, we'll simply use it to graph our timeseries messages and send ourselves an alert if the data stops flowing. This could indicate a problem with the battery in the Sensortag, or that we are out of range. Use your imagination, the sky is the limit, and Circonus has a powerful feature set. You can see the four device IDs here, and the checks that were set up as part of this demonstration message flow. As the metrics are colleted, Circonus tracks it and can create graphs and dashboards for you. There's only a bit of data shown in the graph here because I've only had it running for a few minutes. There are some powerful analytics tools and alerts at your fingertips here. It's hard to show with the small amount of data, but you can use anomaly detection, trend prediction, and many other functions on your data. This is a simple sliding window moving average, which we could use to smooth out spurious temperature readings and prevent the furnace from turning on needlessly. Circonus maks it simple to notify you with an alert if the data stops flowing. This is essential for mission-critical systems. We've covered the details of creating a bip.io workflows elsewhere, and many of the details like endpoints, auth tokens, etc. 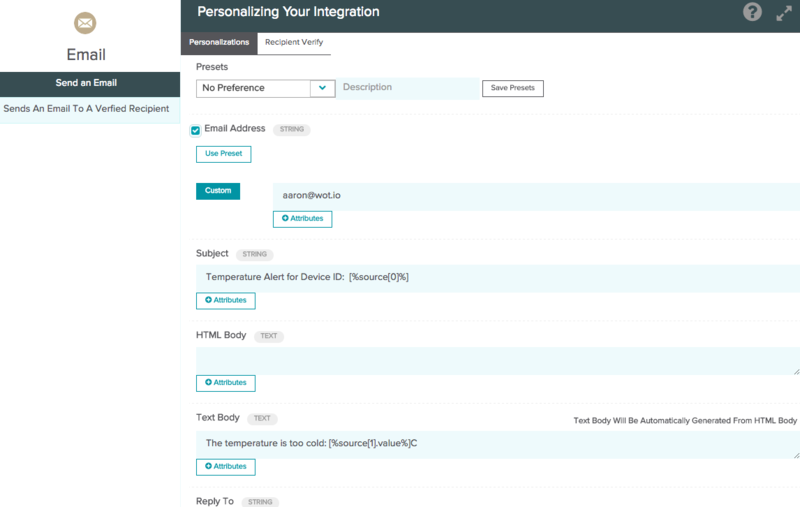 are already taken care of for us automatically by the wot.io integrations and tooling. Here in the dashboard we can see the four bips that are referenced in the above message flow graph. Each has the device ID embedded into the name, and the endpoint. We'll have a look at two of them, both for the sensor ID ending in 00 (which is from the device MAC ending in :70, way back up the chain!). First, the alert. Here we see the overall message flow inside the alert bip. Incoming messages from the wot.io bus are processed by a math expression, a truthyness check, and if it all passes the criteria, an email alert is sent. This will give us a new set point for the Nest, and we send it along in the bip as pictured above. This is a basic setup, and you would want to refine this for long-term use. I'd suggest adding hysteresis to prevent the furnace from turning on and off too rapidly when close to the set point, and calibrate yourself a PID control loop to smooth things out. This concludes our writeup of what turned out to be a rather complex message flow graph. 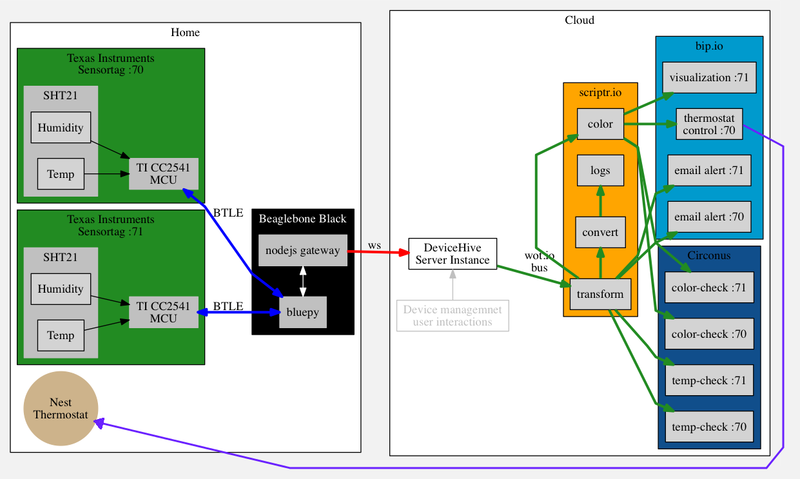 We started with a local network of devices, built a hardware and software gateway to get those devices out to a device management platform, connected that to the wot.io bus, and wired up some powerful tools whose depths we have only started to plumb. Yet even with all the complexity and details that we covered, you can see how simple it is to compose behaviors using the wot.io data service exchange™. And that is the whole point: to get us quickly to a working system. And since it's based on a fully scalable architecture, your solution is ready to grow with you from prototype into production. In other words, you can focus on Shipping your IoT!